Thanks for helping put out the word. I will link to your blog in my next thank you post. Good luck with the challenge. I think you will find it rewarding. It is my pleasure. Thank you for following my blog. It's a pleasure meeting you as I've been following Arlee and he pointed me over to your blog. Glad to see you taking part in the challenge. It's sure to be a fun one! Thank you for stopping by Jeffrey. 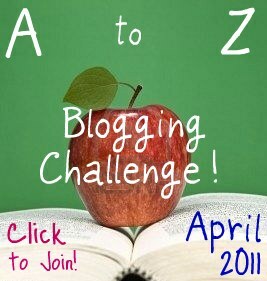 I am actually looking forward to the A-Z Challenge. It sounds like a lot of fun. Wow that is pretty cool! Will look forward to see what you post. Thank you for stopping by Willa and thank you for the comment. I think that this is a rather cool idea. This will also be my first blogfest, so that explains all the excitement.